I think I like this puzzle. 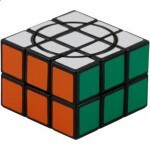 The standard 3x3x2 is just a quick solve, not one I dedicate much time or effort to. However this is a different take on things and perhaps I’ll extend my collection into the bigger crazy cubes. I’d like a basic Crazy 3x3x3. In any event, for now, I wanted to write up some notes. Here is my solve method and my latch piece is red/green/yellow. That’ll lock the center circle in place. I got this one a few months back and was entirely stumped. 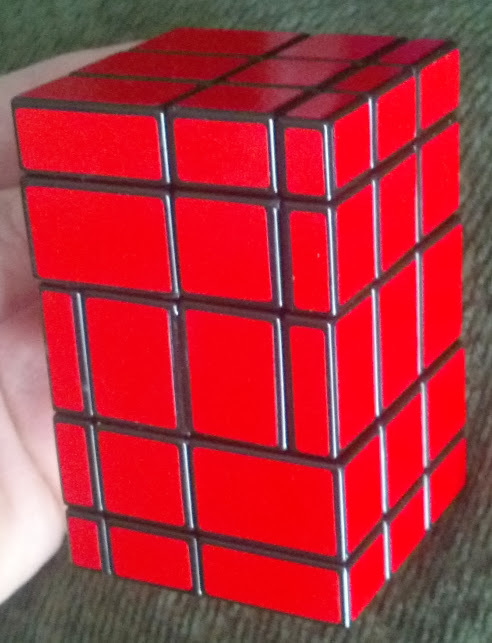 It’s only the second cube to leave me without a solution completely. (The other is WitEden’s Camouflage 3x3x4 – and I think I broke that one!) 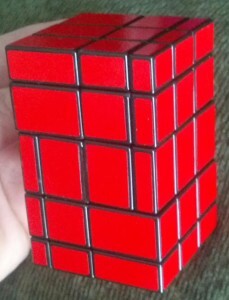 Anyways, thanks to MartyWolfman’s marvelous tutorial; I can now solve it! 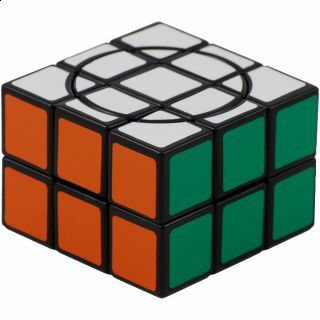 I love cubing but I’m not the most brilliant at coming up with my own algorithms and solutions. For this one, he used a lot of beginner’s method algorithms: something I’d forgotten entirely! For purposes of going back to this puzzle, here are some algorithms and methods of solving. I might need this entry someday! Even though I haven’t been updating much; I have been adding to my cubing collection. The biggest & best is the 4x4x6 cuboid. I feared this would be too similar to my 3x4x5 but it’s better in almost every regard. It’s a lot more fun to solve and since it shape-shifts on all faces; it’s a more interesting puzzle. In addition it’s much more durable than that 3x4x5. Anyways, that’s the old…I’ve got a pair of new cubes on the way. The first is a crazy 3x3x2. I’m curious; I think this should be a unique puzzle. The other is a silly and cheap addition to the collection. This will be a 3x3x1 mirror cube. This one is just filler; it will look good on the shelf though! Since I haven’t updated in a bit, I’ll toss this new stuff on the cube collection page. Dragon’s Crown: Old School & Fun! I’ve waited for this game to come down in price and it finally has. While full retail was a bit too steep for me, $17 was perfect and I caved and got the PS3 game this past week. Now, I still fully expect this to be free on PS+ some time in the next year; so I’m hoping that’s the Vita version. However, after a few hours of play, $17 is nothing when compared to the fun that this game is! In recent years, I’ve enjoyed some new/retro beat-em-ups. However, most don’t have a great balance of old (the action game) and new (well…anything else). The newest Double Dragon is pretty bad and Final Fight Double Impact is really only great because of Magic Sword. Dragon’s Crown on the other hand, is an impeccably-animated romp in a wonderful setting. Swords & magic & loot…what more do you need? Oh…a dragon, clearly. See the title. In any event, I hope to get some good hours in on this in the coming weeks and while it won’t be a platinum trophy title, I’m going to enjoy the heck out of it while it lasts!